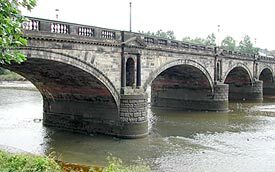 A road bridge of classical design that carries the A6 southbound lanes from Carlisle over the River Lune. It's five elliptical masonry arches each span 64ft. The deck of the bridge is 33ft wide between parapets. The spandrels between the arches and at the abutments have stormwater channels through them, the entrances to which are framed in Doric pilasters and pediments. Elliptical arches and storm-water channels were 18th century innovations in bridge building. Onside one of the stormwater channels is graffiti reading "Mark Froggitt 1778". Froggit was likely one of the masons who worked on the bridge, as there is a record of such a person from Skerton marrying in St Mary's, Lancaster, in 1786. Thomas Harrison, who lived in Lancaster in the early 1780s after spending time in Italy, won a design competition for this bridge, the prize being £20. He supervised its construction closely and its deseign is reminiscent of an ancient Italian Roman bridge at Rimini. The design is important for its use of a horizontal roadway and balustrades across the full width, an innovation in Britain at the time. Other designers, including John Rennie, soon adopted this horizontality. Rennie visited Lancaster during the construction of Skerton Bridge. Harrison was much influenced by what he learnt in the seven years he spent in Italy. He believed that architectural masonry should use as large blocks of stone as possible, such as he had seen in antique buildings. In Britain he gained a reputation as an expert bridge designer. His last work was Grosvenor Bridge, which has a single arch span of 200ft, the longest masonry arch in the world at the time and still the longest in Britain. A sixth somewhat unsympathetic span to Skerton Bridge was built over the railway at the south end at a later date.